What are the potential cost savings associated with outcomes related to homelessness, criminal justice detention, behavioral health inpatient stays, connection to outpatient primary care, and employment during 2012–2016? To what extent are the costs associated with serving FSP clients recouped via savings associated with those measurable outcomes? Los Angeles County used some of its Mental Health Services Act funds to greatly expand access to Full Service Partnership (FSP) programs. 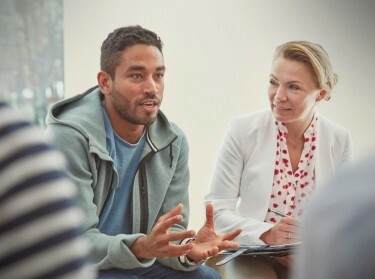 These programs, for individuals with serious mental illness, use a team approach to provide comprehensive, community-based psychiatric treatment, rehabilitation, and support to move toward recovery and resilience for target populations. For this report, the authors estimated annual government spending associated with five outcome areas targeted by FSPs: homelessness, criminal justice detention, behavioral health inpatient stays, connection to outpatient primary care, and employment. The focus is on government cost savings from these outcomes over a five-year period (2012–2016), comparing spending during the 12 months prior to individuals' enrollment in FSPs with the 12 months after FSP enrollment. 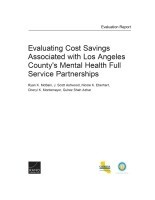 There is evidence that the investment Los Angeles County has made in its FSP programs has yielded positive outcomes and resulted in a substantial decrease in spending on criminal justice detention and more-moderate decreases in spending on behavioral health inpatient stays and on clients who are homeless. There are also nonfinancial benefits, such as improved mental health and quality of life, that could not be incorporated into the financial analysis. Those savings represent a 24 percent reduction in non-FSP government spending. For the five outcomes studied, non-FSP government spending on the 24,282 FSP beneficiaries was reduced from $345 million to $262 million. The largest cost savings came from reductions in criminal justice detention ($63.1 million in savings). This was followed by savings for behavioral health inpatient stays ($14.2 million, or 18 percent) and homelessness ($2.6 million, or 4 percent). When comparing cost savings by group (children, transition-age youth, and adults), the largest cost savings in relative terms came from transition-age youth (30 percent) and in absolute terms from adults ($51.6 million). Cost savings were observed across four of the five outcomes examined. The exception was connection to outpatient primary care, where there was a 16 percent increase in spending; however, this increase likely mitigated the risk — and associated costs — of inpatient care for physical health conditions. The total expenditures for the first year of enrollment for the 24,282 enrollees were $335.3 million. The estimates of costs and savings are intentionally conservative but indicate that at least 24.7 percent of the expenditures for clients' first year in FSP programs was offset by savings, without accounting for indirect financial benefits, other potential financial benefits not associated with the five outcomes, or any nonfinancial benefits associated with improved health, housing, and employment among beneficiaries. LAC DMH should strengthen its data collection efforts by collecting data on a wider range of outcomes of interest, using multiple-item scales instead of single-item measures, and ensuring that data are collected at regular time intervals. These efforts would improve the value of the data for tracking changes in outcomes over time. Improving measurement of client status over time through the key-event records would allow for more-accurate measurements of housing, education, and employment status. LAC DMH should measure items that more accurately capture social engagement and meaningful activity. Ryan K. McBain, J. Scott Ashwood, et al. The research described in this report funded by the Los Angeles County Department of Mental Health, in partnership with the California Mental Health Services Authority (CalMHSA) and conducted by RAND Health. McBain, Ryan K., J. Scott Ashwood, Nicole K. Eberhart, Cheryl K. Montemayor, and Gulrez Shah Azhar, Evaluating Cost Savings Associated with Los Angeles County's Mental Health Full Service Partnerships. Santa Monica, CA: RAND Corporation, 2018. https://www.rand.org/pubs/research_reports/RR2783.html.